I leap forward immediately, pulling my pants off in one fast gesture, screaming, “No, no, no.” I yell out other words I cannot remember beyond the taste of them in my mouth, the feeling of them spewing out without my permission, without any conscious thought. I look toward Esmé, who remains playing quietly ten feet away, blissfully unaware of the fire. Naked and breathing heavily, pain shooting through my legs, I move quickly into the bedroom. In there, uncertain of what to do next, I fold my clothing neatly on the end of the bed. Into the bathroom now, I dig for aloe vera lotion, but, glancing down at the red welts that have taken over my thigh and the redness lower, that I cannot yet look at…I put it back down. After I hang up, I force myself to look carefully at the reddened mess spreading across my ankle and down my foot. The skin is peeling back, wrinkling like a pair of too-loose stockings. I’ve been on fire before. The feeling of my daughter’s body in my arms, tremors passing through her, into the core of me. I force out a sound, hoping to soothe her: Sshhhhh, sssshhhhh, it’s ok. It’s ok. Maman is here. Every muscle in my body stiffens to support her. My eyes, unblinking watch her face shift from rosy, to gray, to purple, to blue. I am poised, ready to react. Every inch of me burns with anger, fear, and sadness. But I need to ignore it a bit longer. I take a deep breath move awkwardly into the kitchen. I grab a ziplock bag and dump all of the ice in my freezer into it. I look down again at my legs, eyes draw to the spots that are the scorched, places from where the pain emanates. I imagine the ice pressed against this skin and the cold burn. I imagine the heat of my skin melting the plastic bag, it merging with my skin. The world shifts a bit, dizzily. I do not press the ice against me. I bend to lift my daughter’s body up, trying (and failing) to not bend in the places I am burned. I set her in the crib, move into her bathroom and start running cold water into the bath. “It’s going to be fine.” I say out loud to myself. The frustration of seeing the next battle laid out in front of us creates knots of sparking anger in my chest. It never ceases to amaze me that while my daughter must engage in combat against so many unavoidable fights beyond what most people can imagine, I must spend my time also fighting avoidable ones on her behalf. This time—just one in a long line of insurance denials, ego-driven doctors, sloppy bureaucracy—it is school. The school district CSE chair tells me flatly that they’ve yet to find a nurse to attend school with my daughter. We are four months into the school year. I remind her, growing increasingly angry, that the district is legally bound to provide her with a nurse so she can go to school. There is no nurse…I’ll keep looking…You can be her aide in the classroom. She repeats these refrains, calmly, as though denying my daughter access to school and requesting me to fill the role they are required to pay someone to fill is just one thing in her lengthy to do list for the day. My mother calls. I answer the call from where I am seated on the cold tile floor of my daughter’s bathroom, wet towel draped over my legs. The phone cuts out. I imagine where she is on the drive—knowing all the spottiness of cell phone coverage between here and there. I touch the towel. It was chilly moments before, but my body has warmed it so quickly. I peak under the towel. One of my legs is shaking, the ankle twisted slightly, pulled by the tightening skin. The phone rings again, but I don’t answer. I know she’s not fully out of the dead zone yet. I cannot focus enough to deal with trying to talk as she cuts in and out. Instead I look down at my legs and think: thank God I waxed last week. As soon as the vote is final, I see nothing but red. I pick up the phone and start dialing the first Senator on the list. And then the next. And the next. Most of them go to voicemail. Most of the voicemails are full. Because this is democracy in America in 2017. I may have not right to call the senators who do not represent me…but they aren’t playing by the rules…why should I? Finally I get an aid, I struggle to maintain my composure. I can hear the phones ringing in the background. I imagine the swarm of angry voters on the other end of all of those lines…I imagine their children. I wish I had called from an old landline so I could hear the satisfying sound of a headset hitting the cradle, hard. Instead I aggressively hit the red hang-up button. It doesn’t work. So I take a deep breath, and tap it again…this time softly. The phone screen grays out; the call has ended. I start dialing the next name on the list. I show the EMT the burns, even though I want to hide them…like I’d prefer to crawl into a hole. I’m trying to ignore the fact that I am wearing nothing more than the robe I’d snatched from the hook in Esmé’s bathroom and a bra. “Why did you wait so long to call us?” The EMT asks as he examines me, looking for burns elsewhere. My whole body feels hot. I feel oddly like a thing…a thing who moves agreeably through the next steps, into the stretcher, panting at the feeling of the blankets wrapped around me, nodding at the words of apology. Clinging to the fabric of the EMT’s pant leg in the back of the ambulance, trying to hold still until he can place the IV as we hit every pothole. Turning inward and seeing only white, like I remember from labor. Tears spilling out of the corners of my eyes as the morphine hits my bloodstream and my body relaxes. The fire isn’t gone. I just accept it. Normally the paragraphs come flying off of my fingertips, landing like sparks, burning on the page. Burning, illuminating my way forward. I can take ahold of my smoking words and pull them outside of me. But not now. Not these days. The words sit, fuming, red-hot, stoked so that I cannot grab ahold of them and sight them, sparking, in any direction. Instead, I sit in the burning rage…smoking in the careless words of others. The language of politics turned deeply personal: snowflake, whiner, tantruming child…those words suddenly unleashed carelessly by my fellow Americans back at me as I try to explain why my daughter matters. Why her Medicaid matters. Why her rights matter. Words, I know, better describe the icy individuals tossing them around, than focused burning flames of those at whom they take aim. They take aim at people who, over and over, persist. Who persist, gracefully. Who persist, angrily. Who persist, because they have no choice. Who persist because they are on fire. Weeks later, the evidence is seared into my skin. It has healed, mostly. 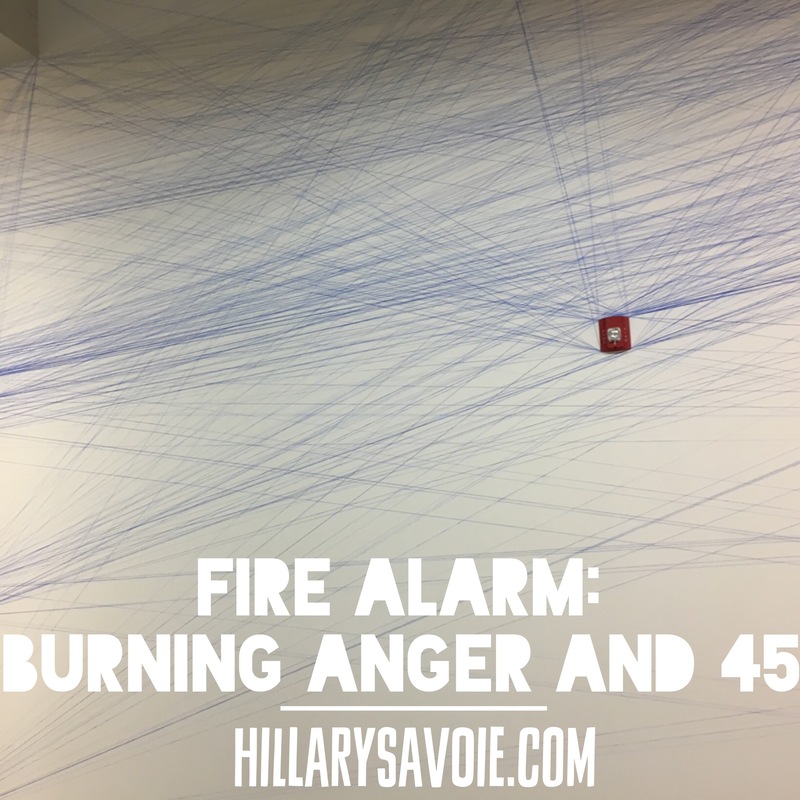 Occasionally my skin sends nervous warning shocks through my system, saying, fire, fire, fire! I respond, I know. Buck up. Get used to the fire. Damn, woman. This is amazing. I’m glad I didn’t read this before writing as I’d never have written knowing that this is “being upset” at its finest. I am on fire. Together, with you. Wow. It took me a while of reading, little bits of the true meaning of what you’re saying here, hitting me all throughout as I read. It comes together as pieces to a completed puzzle. I am blown away. This is powerful stuff. Everyone should read this. I would like to say it would make people understand, but not all people, sadly. Still, you are mighty in every word you’ve written here. So well said. Just beautifully heart wrenching. Really. I love the way you’ve described this as a puzzle. I think most of my favorite writing to do works that way…both a puzzle to read through and a puzzle to write. I never quite know where I am going, but I very much like the process of getting there. Thanks so much for your kind words! Whoa. I am on fire myself. Let us not burn out. I’ve been on fire before too. Never like this. Not since early November. This is so gorgeous. I like with you were both saying above about a puzzle. When I’m fully on fire, I tend to write that way too – although rarely eloquently. So I see your fire and bow down to it.